Change is hard. The flipped classroom, while a powerful and growing force in medical education, is a major change for many health professions' students. Instructors may avoid “flipping” due to anticipated student resistance and poor course evaluations. 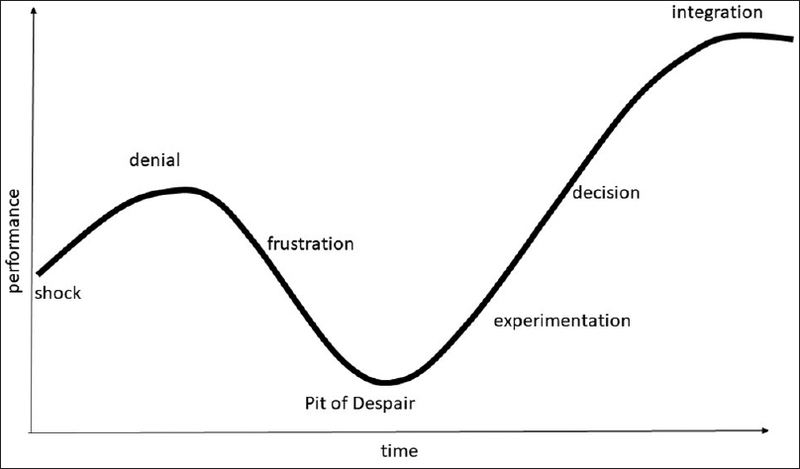 The business community has developed specific guidelines on how to manage change using the Kubler-Ross death and dying change curve. This article suggests the change curve and related management strategies can and should be applied to flipped classroom scenarios. Action steps are provided for each stage that can help students move from stress and frustration (“I can't learn this way”) to integrated learning as fast as possible, while simultaneously allowing the full advantages of the flipped classroom to be realized. Background: Making a diagnosis of infectious disease requires knowledge of the symptoms, signs, and diagnostic tests associated with that disease. Many healthcare professionals use online clinical decision support resources to help learn how to make a diagnosis. One common and popular resource is BMJ Best Practice. The purpose of this paper is to share educational themes that can be drawn from the BMJ Best Practice clinical decision support resource. Methods: Documentary research was conducted on the diagnostic approach sections of the top 10 most viewed infectious disease topics. Topics included HIV, hepatitis B virus (HBV), infectious mononucleosis, hepatitis C, dengue, hepatitis A, influenza, measles, avian influenza, and Ebola. Results: Seven key themes emerged as follows: Clinical features remain paramount in learning about the diagnosis of infectious disease and elicitation of risk factors (including travel history) are an important part of the clinical history. Diagnosis is important in and of itself but is also important as a step toward notification, public health surveillance, and infection control measures. The differential diagnosis and coinfection are important considerations when learning how to diagnose infectious diseases as is the precise phase or stage of the disease in question. Conclusions: Much of the medical education literature focuses on the instructional design within the resources, rather than the actual content within the resources. This article attempts to redress this gap in the literature by describing the results of a detailed analysis of the content. Introduction: Generation of appropriate lists of differential diagnoses for various radiographic findings can be challenging for veterinary students and practicing veterinarians. Methods: In this randomized, controlled, experimental trial, an educational card game was developed to help students learn differential diagnoses associated with different radiographic renal appearances. Third-year veterinary students in an imaging class took a pretest and were then randomly assigned to either play the card game or study conventional radiographic cases to learn differential diagnoses. Participants in both groups then took a posttest and a 1-week follow-up test to assess their learning. Test performance was compared between students who played the game and those who studied radiographic cases. Results: On the immediate posttest, students who played the game scored higher than those who studied by conventional means (8.1 vs. 5.5 out of 10 possible points, P < 0.0001) and students who played the game also scored higher on the follow-up test (13.1 vs. 10.4 out of 20 possible points, P < 0.0001). Conclusion: Educational gameplay may be more beneficial than conventional case study for learning differential diagnoses. However, the relatively narrow focus of the game used in this study will prevent it from replacing conventional learning for all applications (such as lesion identification). Background: The use of ultrasound (US) continues to expand in veterinary and human medicine. The purpose of this study was to assess the current practices and potential barriers to the use of US in veterinary small animal general practices. Methods: An electronic survey was administered to approximately 1000 veterinary practitioners in the Southeastern United States. A total of 296 veterinarians completed the survey. Results: Among respondents, 53% reported having an US unit in their practice and 45% reported performing USs more than five times weekly. The most common reasons for not having an US unit were prohibitive cost (27%) and lack of training (27%). In addition, 74% responded that US training for a new graduate was extremely or very important. Conclusions: This study is the first to document the common use of US in small animal general practices and highlights the need for instruction of basic US skills for veterinary students and small animal practitioners. Introduction: Job descriptions outline competencies employers consider requisite for success and can be used to inform curriculum design. This paper demonstrates the use of text mining to determine the extent to which key educational outcomes align with job descriptions. Methods: Eighty pharmacist job descriptions containing a total of 12,064 words were text mined using the “bag of words” method. Results: A majority of the 20 most frequent job description words were also present in the pharmacy accreditation standards and American Association of Colleges of Pharmacy entrustable professional activity statements. However, several top 20 words were not, including customer, dispense, department and company. 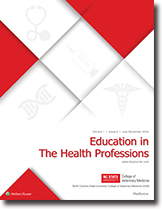 Chi-squared tests revealed text differences between community and health-system pharmacy, including patient, manage, information, and customer, which may have implications for pharmacy schools preparing students for various practice settings. Conclusion: The methodology described here provides a feasible and efficient approach to analyzing current workforce expectations and mapping them to educational outcomes. The ultimate goal of medical education is to train and prepare aspiring physicians to respond to the health needs of the general population. At present, the medical education system in India relies on a curriculum that is teacher centered and time oriented. Unfortunately, this approach has led to a decline in the competence in recent medical school graduates. A more promising alternative is competency-based medical education (CBME). The implementation of CBME in India could dramatically improve the medical education system and ultimately improve patient outcomes. This article discusses the steps necessary to successfully plan and implement CBME in Indian medical colleges.